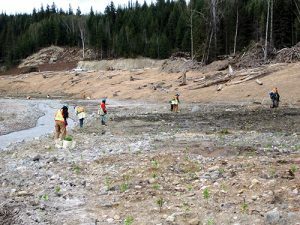 When the Mount Polley tailings storage facility failed in August 2014, it sent 7.3 million cubic metres of fine tailings, 600,000 cubic metres of construction materials and 17 million cubic metres of water into the local watershed, uprooting trees and vegetation in its path and depositing the slurry in Hazeltine Creek, Quesnel Lake, Polley Lake and Edney Creek. Three and half years later, the mine’s owner Mount Polley Mining Corp., a subsidiary of Imperial Metals, has spent about $70 million on rehabilitation efforts. It also has 3.5 years’ worth of data from testing of water, aquatic life, soil and plants to assess the effects of the tailings facility breach, contained in thousands of pages of studies including post event environmental impact assessment reports, a human health risk assessment, and an ecological risk assessment, all of which are posted on its website. So what has it found out from all that testing? Anglin, former president and CEO of Geoscience BC, is a relative newcomer to Imperial, having joined the company in September 2014 as part of Imperial Metals’ support to Mount Polley, just one month after the breach occurred at the operation, about 56 km northeast of Williams Lake, B.C. “It has been a large, challenging, but very interesting multi-disciplinary research project to look at the impacts of the spill, to design monitoring programs, mitigation and remediation programs and determine what risk if any there is to human health or the environment from the spill,” Anglin says. News coverage of the Mount Polley failure described the tailings as “toxic” – a characterization that, fortunately, has proven inaccurate. “Unfortunately, the word toxic gets tossed around a lot and I think a lot of people don’t understand that just about any chemical can be toxic,” Anglin says, adding that toxicity is determined by the concentration and form of exposure. As a low sulphide copper-gold alkalic porphyry with a lot of carbonate associated with the mineralization, Anglin explains the deposit is basically a self-neutralizing system. She adds that it’s also low in a lot of the metals about which people have expressed concern, like cadmium, arsenic, lead or zinc. The tailings that escaped the tailings storage facility are essentially copper-rich sand. As for other chemicals of concern, the deposit is not high in arsenic: although there is an arsenic signature in Quesnel Lake, it’s there naturally and does not come from Mount Polley. The deposit is not high in selenium either, but it’s enough of a concern that it is addressed in the company’s water treatment plan. The company has also installed a water treatment plant to reduce the levels of particulates, which reduces the levels of selenium and copper in effluent, as well as other metals. As part of its impact assessment work, Mount Polley has done a lot of toxicity testing of the sediment, the water, and of their impact on aquatic organisms. While she says the company doesn’t have a lot of detailed information on the lake water quality before the spill, thanks to an innovative study by the province and supported financially by Mount Polley, it does have one year of pre-spill data on resident fish populations in Quesnel Lake. Data from the study, which used electronic tags on fish and sensors in the lake on floating buoys to track the fish, showed that there was no fish mortality in 2014 or 2015 associated with the spill, and no significant change in fish behaviour. appeared in Quesnel Lake. The plume, which was formed from fine grained particulates that initially remained deep in the lake, and then, when the lake turned over in the fall, was present at surface for about five to six months, causing the water to look cloudy. Mount Polley did toxicity testing of this cloudy water on rainbow trout eggs and alevin – an early stage at which the fish are considered very sensitive. “We took some of that water, which would have been the worst case water that a spawning trout or salmon would see in the river and we saw no impact on the development of those fish. Anglin adds that the province recently increased the lake trout fishing quota, which had been quite stringent for years before the spill. As predicted by water modelling completed by consultants, the plume cleared by spring 2015. As for the potential for turbidity to return and stir up the sediments, the company doesn’t believe it will be an issue, noting that regular monitoring of water quality indicates that it hasn’t recurred since Hazeltine Creek was reconstructed. Remediation – what’s been done? In contrast to the chemical effects, the physical effects of the spill were dramatic. These have been the central focus of remediation efforts at Mount Polley. 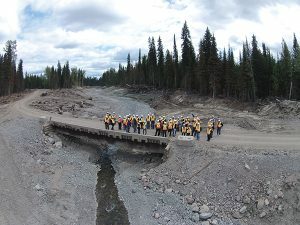 The first thing Mount Polley did was to clean up and reconstruct the 8-km-long Hazeltine Creek, which had been deeply scoured by the spill, and remove tailings from the creek valley. The company estimates that about 400,000 tonnes of tailings have been removed from the creek. About 1 million tonnes of rock was used to construct a new creek channel and the access roads for the creek construction. The bulk of that work was completed by May 2015. Since then, the company has been reconstructing fish habitat in the creek, which rainbow trout that live in Polley Lake use to spawn. Fish habitat has been completed along 2.5 km of the upper part of Hazeltine Creek and Mount Polley is hoping to re-introduce fish into the creek this spring. Most of the remediation work has been completed with the assistance of contracting companies that are joint ventured with two local First Nation bands. Mount Polley lies on the traditional lands of the Williams Lake Indian Band and the Xatsull First Nation (Soda Creek Indian Band), both of which have partnership agreements with Mount Polley. The ongoing working relationship with the two bands is demonstrated by the fact that both bands have renewed their partnership agreements with Mount Polley since the tailings breach. In addition to reconstruction work, rehabilitation efforts have included planting of over 300,000 native shrubs – a mixture of willow cuttings from the site, plants grown from seeds collected at the site, and seedlings of native plants. Remediation of the site isn’t complete yet, and it remains to be seen what level of remediation will be considered sufficient. Mount Polley submitted a conceptual remediation plan to the B.C. Ministry of Environment in January. The plan includes tailings being removed wherever they would prevent the site returning to a naturalized environment. This includes areas where the released tailings are very thick, such as near the tailings storage facility. Most of this work has already been completed by the mine with over 350,000 tonnes of tailings removed, Anglin says, and more work is planned for 2018. Tailings are also being removed from areas where they would be subject to remobilization in a heavy rain or spring freshet. That material may be put back in the tailings facility, used for construction, or potentially stored to use in remediation. However, in some areas, the company believes it might be less disruptive to let some of the tailings sediments remain where they are. Dredging Quesnel Lake to remove tailings sediments, for example, would disturb the benthic community (organisms that live on and in the lake bottom), which has slowly started to return as natural sedimentation and organic material are added. “Dredging would involve fairly significant disruption – we’d be probably looking at generating more turbidity and there would be a lot of infrastructure required, a lot of equipment required,” Anglin says. The company has presented the draft conceptual remediation plan in community meetings in late 2017, and will be consulting with First Nations and the public on the proposal. A long-term water management plan for Mount Polley was approved last April. The site was always predicted to have a positive water balance because of its location in an interior rain forest, and needs to discharge water into the local watershed. Now that storing extra water in the tailings facility is no longer acceptable, the need to discharge water is even more pressing. All mine contact water is treated before being released. To meet water quality guidelines, Mount Polley’s water management plan relies on meeting very stringent permit conditions for effluent. These conditions mean that the water being released into the lake meets all 30-day aquatic life protective water quality guidelines (more stringent than drinking water quality guidelines) within a 100-metre initial dilution zone (IDZ) perimeter around the discharge point. Anglin notes that the lake often naturally exceeds these water quality guidelines, so the conditions on the mine’s effluent are very strict. The company has faced criticism from members of the public that would like the effluent itself to meet 30-day water quality guidelines, but Anglin says the mine’s water management plan was developed based on a detailed best achievable technology (BAT) assessment, and a permit was issued by the B.C. government, after thorough review, as protective of the receiving environment. Longer term, the company is looking at options for passive or semi-passive water treatment, for example through constructed wetlands, that could replace the water treatment plant after closure. The mine is permitted to 2022, but there is potential to extend the mine life. Since the tailings facility was put back in operation in June 2016 after being repaired and fortified with buttressing, there have been strict limits on how much water can be held in it. But why put the tailings dam back in operation? Mount Polley certainly needed revenue from the operation to help pay for the remediation. The company also had a strong desire to keep people employed in the Cariboo Region. Considering it wanted to continue mining and needed a place to put mine waste, after a detailed analysis of options, it concluded that using the existing facility was less impactful on the site than building a new one would be. With the assurance of the Independent Engineering Review Panel (a group of four independent engineers, including one that represents the local First Nations), and several detailed studies on the facility and its failure, the company is certain the dam will not fail again. But the spill has both the company and the wider industry questioning the status quo when it comes to waste and water management. Sub-aqueous deposition was largely adopted in the mining industry to prevent acid mine drainage (by not exposing sulphidic minerals to the air). But since Mount Polley tailings are not acid generating, why have a tailings pond at all? “It’s a really good question,” Anglin says – and one that she admits she doesn’t have an answer for. Neither does the industry at large. Adopting less conventional mining waste technologies will require changes in the approach to water at sites and in site processes, and the industry’s mindset. But the Mount Polley failure has set the course of the industry firmly in that direction.